I am often asked what my favorite place to visit in all of Italy is; such a difficult question to answer in that Italy’s lore is ubiquitous – laying within the bustling cities, the hilltop villages, and rustic countryside. It’s diversity is echoed though the people, food and culture of each province. Undoubtedly, some of these extraordinary spots tug at my heart strings more than others, Tropea is surely one of these places. Tropea is located within the province of Vibo Valentia, Calabria overlooking the Tyrrhenian Sea on a stretch of coastline called the Costa degli Dei, the Coast of the Gods; absolutely a slice of heaven. Perched high on a rocky cliff with an iconic historic center, Tropea has long been the summer playground for many northern Italian and European vacationers. Our family time spent along this remarkable coastline has been some of our most memorable when in Italy. I defy anyone to propose a seaside vista complete with unforgettable sunsets and warm genuine people that can compare to Tropea. So you ask, Paula what does this have to do with a post about Linguini with Swordfish? Well you see, most of our lunches while here are taken poolside, under the shade of a pergola. Our hotel always serves a leisurely luncheon buffet of regional Calabrian specialties. In addition the chef will at your request grill a freshly caught piece of swordfish (spada) dressed with a light coating of olive oil and sprinkled with local wild oregano. Spada is served much more thinly sliced in Italy than we are accustomed to. The flavor and texture of this swordfish is unmatched by anything I have eaten in the States, even at a top restaurant or from a respected fishmonger. Spada is one of Mio Marito’s favorites, whenever I prepare it he will longingly refer to our holidays in Tropea. Our lunches poolside, the family gatherings, drinking wine with Zio Mimi, Michele, Nuccio and Leonardo – and of course watching the World Cup Finals. Did I mention drinking wine? So you see it isn’t merely about the swordfish…. Like most Calabrian dishes, Linguini con Spada features the best of what is available. When selecting swordfish for this dish, a thick glistening steak with little or no red flesh is preferable. Preserved lemons provide a subtle citrus quality without masking the flavor of the fish. A pound of linguini, a bit of garlic, a few capers, a handful of freshly chopped parsley, and a nice vino bianco to enjoy while preparing and with the dish – that’s all it takes to bring one back to Tropea. A pasta dish that is full of flavor and simple to prepare. If your fishmonger does not have a thick piece of swordfish, ask him to cut you a piece while you wait. Using a sharp chefs knife, trim the thick skin off of the edge of the swordfish and discard. Do this carefully as swordfish is an expensive cut of fish and you do not want to waste any of the flesh. Cut the swordfish into ¾ inch cubes and place them in an cast iron skillet or roasting pan. Remove any seeds that may be in the lemons and cut the wedges into ½ pieces. Add the cut lemons, garlic, capers and olive oil to the swordfish, stir well to coat the swordfish evenly with the mixture. Set aside in the refrigerator for 1 hour to marinate. Preheat the oven to 425º. Remove the marinated swordfish from the refrigerator and season with salt and freshly ground pepper. Place a large pot of cold water on the stove over high heat. Have a warm serving bowl for the finished pasta dish ready. Place the swordfish into the preheated oven and cook for 5 minutes, open the oven quickly and stir the contents of the skillet, return to the oven for an additional 5 minutes. The swordfish should be cooked, moist in the center without being dry. Remove about ½ of the mixture to the warm serving bowl, set the rest aside on a plate, leaving it in the skillet will result in additional cooking of the swordfish - do not do this. In the meantime, once the pasta water comes to a boil, add a generous handful of salt, stir, add the linguini, stir again. Check the recommended cooking time on the package and reduce it to achieve the al dente stage; if using whole wheat pasta it is sometimes necessary to reduce the time by close to one third. Either way, you must taste it to check, remember pasta continues to cook once it is removed from the water. Drain the pasta directly into the warm serving bowl with half of the swordfish mixture, top with the remaining swordfish along with half of the chopped parsley. Do not discard the pasta cooking water as you may want to add some of it to the finished dish if needed. 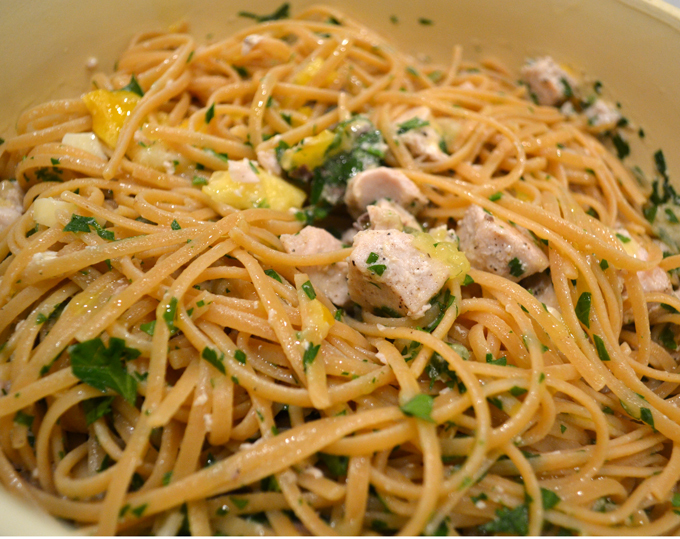 Mix well using kitchen thongs, be sure that the linguini strands are coated with the liquid from the roasted swordfish and parsley. The pasta should not be soupy yet not at all dry, if you would like to loosen it up a bit add about ¼ cup of the pasta cooking water. Sprinkle the top of the dish with some additional chopped parsley and serve immediately.